Informative Blog Written by Teachers Living in Korea ! This year, Korea”s Chuseok holiday fell on a Thursday, meaning we would have Wednesday-Friday off from teaching. A glorious 5-day weekend is a rare thing, so I was resolved to go somewhere awesome this year. As I watched airplane tickets to international destinations steadily climb in price, I turned to domestic spots. I”d been eyeing Ulleungdo for over a year, with it hovering near the top of my Korea Bucket List, and I quickly realized that the Chuseok weekend was a prime opportunity. As if to further encourage my decision, Adventure Korea had a special holiday trip to the island, which included pretty much everything — transportation there and back, three nights in a hotel, various activities, as well as most of our meals. It all looked amazing and the price was right, so some friends and I booked our spots and started obsessively Googling the island. Our Adventure Korea guides also insisted that Ulleungdo is better than Jeju, largely because they feel like Ulleungdo has yet to be overrun with tourists. While tourism is Ulleungdo”s largest industry, it”s less developed, so it still feels like a small island full of fishing villages. Island people just seem to move at a slower pace, which definitely makes for an appealing, relaxing vacation. We left for the island on Tuesday night from Seoul, filling a couple buses that drove all night to the east coast. We stopped at a beach to watch the sunrise before heading to the ferry terminal. Our ferry left from Mukho harbor and took about 3 1/2 hours to reach Ulleungdo. Luckily, we had mostly clear skies to and from the island, but be warned that a ferry”s voyage depends entirely on the weather. 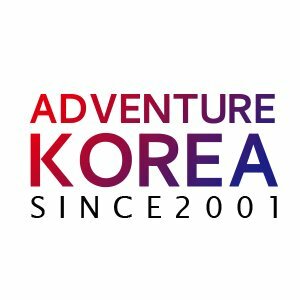 While it wasn”t an issue for us, Adventure Korea wisely scheduled the return to the mainland on a Saturday just to allow for the potential delay due to bad weather. Also, should you be worried about seasickness, medicine can be purchased easily at your local pharmacy or in the ferry terminal itself. Our ride to the island: the Sunflower 2. The inside of the ferry felt a lot like an airplane with sections of lettered and numbered assigned seats. First glimpses of the island from the ferry window. About 125 people were on the Adventure Korea trip, so they rented out what I assume must”ve been the majority of a hotel with traditional floor-mat sleeping. Our meals were largely in the hotel restaurant, which served a variety of Korean food buffet-style. We spent our days on the island hiking around, following the seaside paths and various hiking trails to points that revealed gorgeous views of the island and deep turquoise blue water. The volcanic eruptions formed some really amazing caves, particularly right along the waterfront, through which walking paths have been built. I feel like this would be a lovely picnic spot. Also included in our tour package was a cable car ride, which was a really spectacular way to get a bird”s eye view on one of the villages. From the peak, we were able to look into some binoculars and see the nearby, and hotly contested, Dokdo. Dodong, where we were staying, from above. Turtle Rock, which was one of my favorite spots. Samseonam Rock sticking up in the distance. Another seaside walking path along/above/through the rocks. Ulleungdo is well-known for two things: pumpkins and squid. Pumpkin candies, pumpkin bread, pumpkin jelly, and pumpkin makgeolli were everywhere, the latter being my personal favorite. Definitely something to hunt down when on the island. It was de-licious, especially when served up with some pajeon. Hobak (pumpkins) as far as the eye can see! Squid was also literally everywhere. Racks of it were leaning up against every other house or restaurant, stretched out on a popsicle stick for drying. You could also eat squid in nearly every form: raw, semi-dried, totally dried, grilled, in soup… the list goes on and on. We didn”t get a chance to sample the raw squid, but we did try a couple different varieties of the dried and had a really delicious squid soup for lunch. One thing Ulleungdo lacks is the traditional sandy beaches. The beaches they do have are rocky, which left us really wishing we”d thought to bring water shoes. The rocky beaches did not, however, stop us from jumping in and swimming around. The water was cool and salty and felt amazing after a warm day of hiking around the island. There are a few spots where you can even jump into the water from a bridge or dock! Ulleungdo is a small island, but there are so many other attractions we didn”t get around to doing. There”s a monorail, more seaside paths, tons of hiking, beautiful forests, and quite a few other rocky beaches. 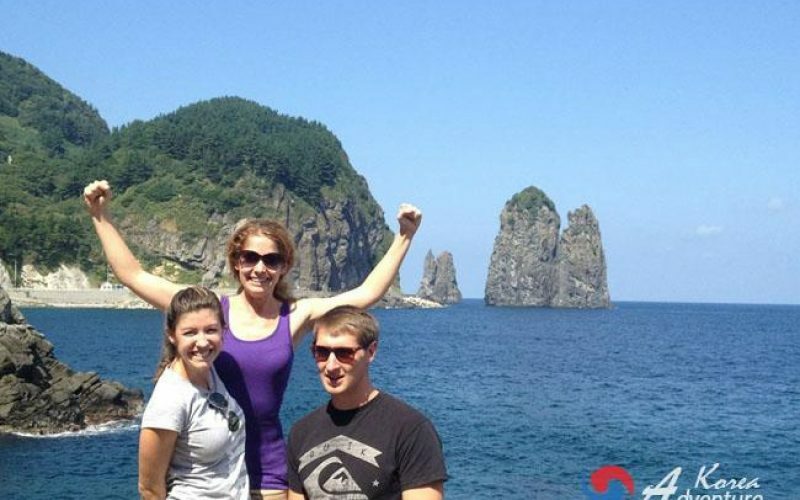 You can even take a ferry out to Dokdo and see it in person! My typical go-getter approach to a vacation in a new place was heavily curbed by my need to relax — I wanted to stroll along the shoreline, eat good food, collect bits of seaglass, and just soak up the sunshine and nature. And Ulleungdo was the perfect place for that. Posing with Ulleungdo”s happy little pumpkin and squid mascots. Although I have a substantial amount of time left in Korea, I already know that Ulleungdo is one of my favorite places that I have seen or will see. Between the rural, quiet fishing village vibe and the awe-inspiring scenery, I can”t emphasize enough that you all need go visit this island. Either with an organized tour or on your own, just go. You won”t regret it.